NotebookingPages.com – Create lifelong learners…one page at a time. 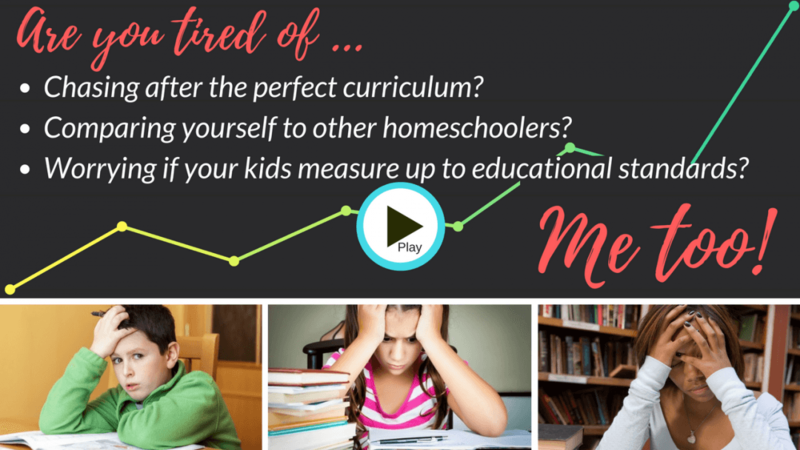 Be productive in your homeschool without the busywork and burnout. Click play to hear my story. Be confident in your homeschool choices. Use effective, simple tools to foster lifelong learning! Sign up below and I'll walk you through this step by step. It doesn't matter what curriculum you use, what method you follow, or how many children you have. 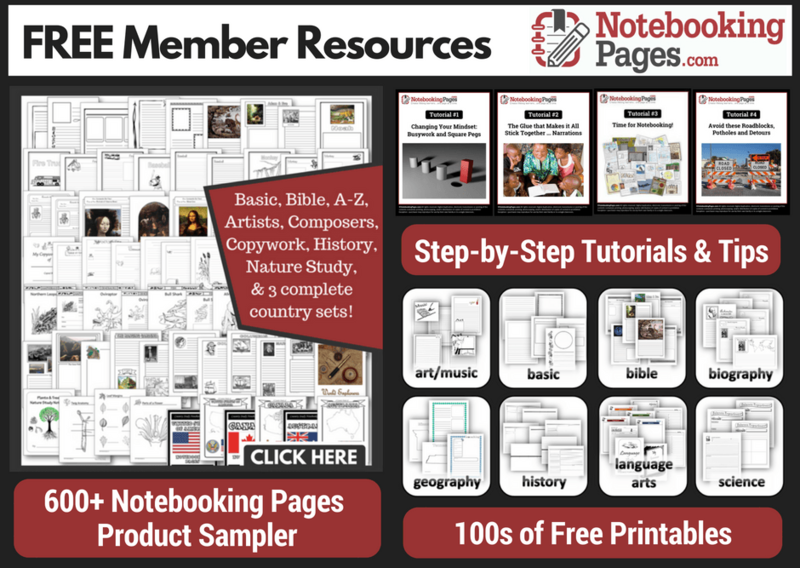 Get started with our free tutorials and 100s of homeschooling & notebooking pages. I knew I wasn’t giving my kids the 'best of the best'. After 6 years of homeschooling, I knew I wasn’t giving my kids the 'best of the best'. I didn’t want them to turn out like me, a great student who 20 years later, with high school & college diplomas in hand, doesn’t remember much of anything taught. When we notebook our studies, they remember more. Light bulbs click. Eyes shine! We have a growing collection of their homeschool journey lining our bookshelves. This is not how homeschooling was supposed to be! Our curriculum just isn’t working. My child hates writing. How do I homeschool multiple children and not lose my mind? I’m tired of all this busywork. My child’s not motivated (honestly, I’m not motivated). I need to simplify our day. Would love to add delight-directed learning to our day. My kids aren’t retaining anything. Want something to cement what we are learning. Need more variety in our day. Tired of wasting money on resources we don’t use. Want a more personalized education. Want an easier way to keep track of what we are learning. Kids can’t wait for the school day to FINALLY be over. Want something tangible to help lessons "stick". Want my children to learn, not just pass a test. Want my kids to enjoy learning without having to prod. Feel like we are not getting enough done. We are so bored! the reasons they joined our membership program. Take a peek into my homeschool story. We all have days (maybe weeks, months, even years), where we are plain worn out, discouraged, or frustrated with homeschooling. Homeschooling just isn’t working out like we thought it would (or should). With these two tools, she said I could completely change the dynamics of how we homeschool. After six years of overwhelm, I was ready to try anything! Sign up for your free membership today. I’m a homeschooling mom of 4 children who are various ages. 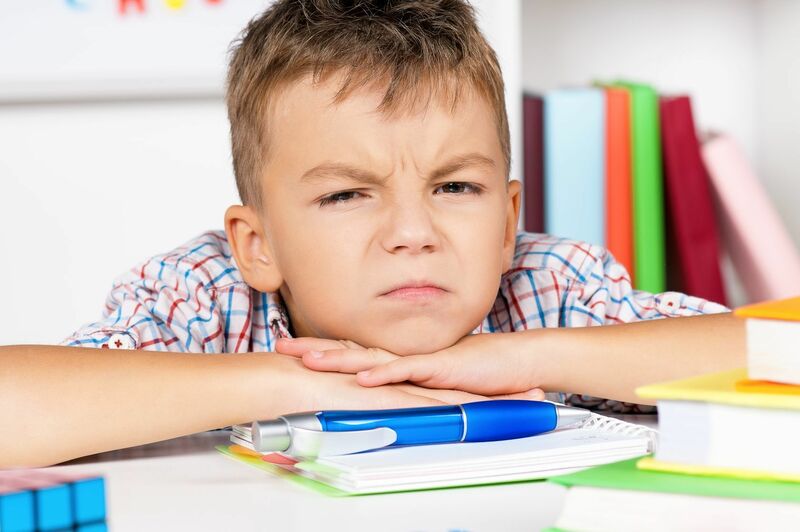 One child has moderate/severe ADHD. We’ve tried various ways of learning and found that notebooking and lapbooking was the most successful and the best received. We’ve been using these wonderful notebooking pages for years! Each time we begin a new unit, I simply log in to print the needed pages and we are on our way to another great learning adventure. These pages have saved me so much time over the years and I am truly grateful for all of your efforts. I always recommend these pages to friends and family! We are loving notebooking! Let me just say it has completely changed our school for the better. Now the girls are really excited to "do school". I was about to give up even though I knew it was what God wanted us to do. School was just drudgery. This has breathed new life into our home and days. How could something so simple provide such relief? If you can't enjoy what you are doing, then, what is the point? We are so happy to be notebooking. I have always wanted to make custom pages for my children so they could tailor their specific lessons for themselves. notebookingpages.com allows me to do this for each of my children and it’s very easy to use. Thank you for creating this for us homeschooling moms who love to use notebooking as an added tool to teach our kids. I have 4 kids 8,8,4 & 3. When we started homeschooling 2 years ago I was so overwhelmed, trying to figure out how to make sure they retained what we learned. When I found https://notebookingpages.com I was so thrilled to find a way to make sure they were retaining information, practicing their writing skills, improving their handwriting, all while having a good time. This was the answer! As I started notebooking I learning that even beyond being great for my 8 year olds, the little ones (4 &3) enjoying coloring, drawing and beginning their writing skills on the notebook pages as well! Now it’s a full family activity, and I am able to give each child a page that is at their level in the same subject! A total homeschool homerun! I have been using some of Deb's notebooking pages via CD-ROM from years past and am so excited that I was FINALLY able to purchase a Lifetime membership! Thanks Deb for making this available. Your pages definitely help our day run a bit smoother while offering another avenue for creative expression and narration. Being a Lifetime Member means never having to renew. It is always there for me. I can print out what I need when I want it and it’s already paid for! This is such a great idea Debra has worked so diligently on over the past years. 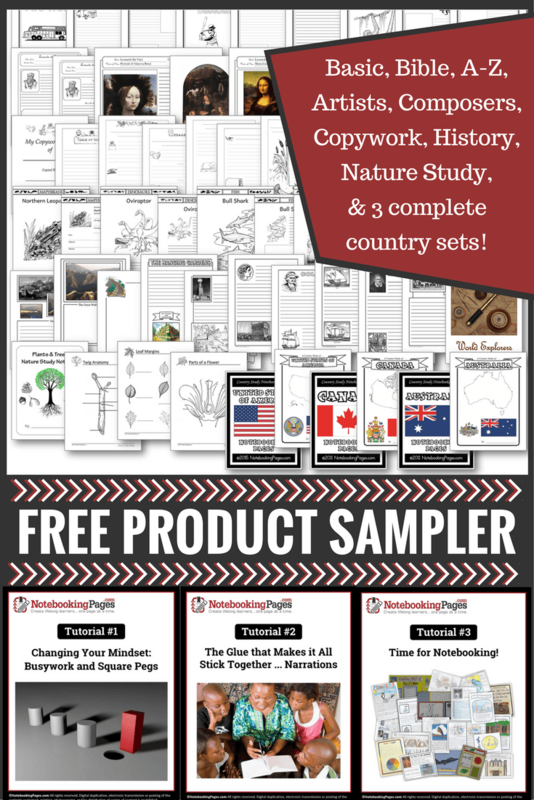 Enter your details below and we'll send you our Notebooking Pages product sampler & EasyStart tutorial series! You can get started today. Use with or without a curriculum. Homeschool the way that fits your family.